Protecting your truck doesn’t mean that you have to treat it like a priceless vase that will be utterly destroyed the second the wind blows too hard. Instead of worrying, you can have the truck accessories experts at Safari Truck & SUV Accessories in Jacksonville install brand new Line-X protective coatings on almost every surface of your truck! 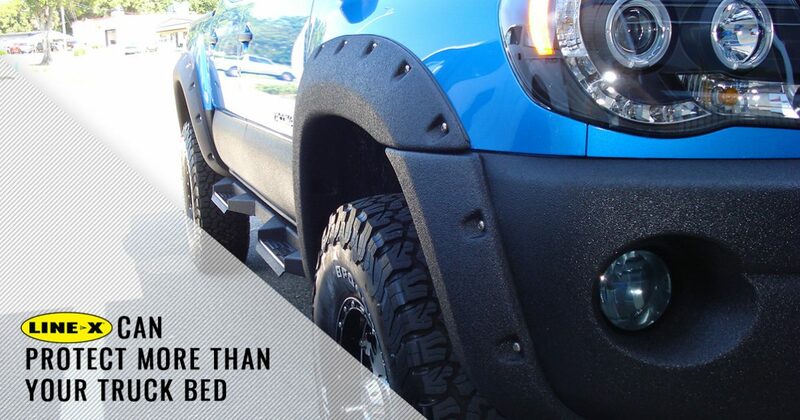 While everyone knows that there is no stronger, longer-lasting bed liners out there than Line-X, you may not have known that Line-X can be applied to nearly every part of your truck. If you want to keep your truck as safe as possible, give Safari Truck & SUV Accessories a call today. We can discuss what kind of protection you need and provide you with a free quote. Modern suspension systems and other components found near your wheel wells can easily be damaged if a rock or other debris breaks through one of the wells. Have us add protective coating to your wheels wells to increase their strength and to keep vital parts of your ride safe. A coating of Line-X in the wheel wells of your SUV or truck will also be much easier to clean than if they were untreated. Grab your garden hose, give it a few sprays, and watch the mud and dirt come right off. When you spend a lot of time driving, your bumper will take the brunt of small- and large-scale damage. Everything from flying rocks to sand and other debris can scratch and dent your bumper. Save yourself the cost of new paint or a new bumper and have us apply Line-X protective coating! Our Line-X trained and certified technicians know exactly how to spray the coating to safeguard your engine compartment and radiator without adding too much weight. Line-X also looks great as an accent color! Door panel-, interior-, and full-exterior coatings are all possible when you choose Line-X! Seriously, there isn’t a surface that we can’t cover with Line-X. If you spend a lot of time riding around in the swamp or along the beach, we can protect the floor of your truck or SUV with Line-X to prevent the water from causing rust. If you are out in dense forest, a full exterior coat can stop tree branches from scraping up your paint. On top of the unparalleled level of protection, Line-X protective coatings also look great, which means that you don’t have to trade utility for style. Reach out today to get started with your project. Get the unmatched protection of a Line-X bed liner on almost any other surface on your truck by calling Safari Truck & SUV Accessories in Jacksonville today! We carry a wide range of accessories that can turn your truck into an unstoppable machine that is perfect for your needs. We have tonneau covers, nerf bars, grille guards, and other truck accessories that you want. Call us today for more information or for a free quote on protective coatings, bed liners, and anything else we have available.